In 1980 Laura Chenel, a woman from Sonoma County California, became the first commercial producer of goat cheese. Her efforts brought this cheeseboard mainstay out of the specialty stores and into the homes of American families. While cheese made from goat’s milk doesn’t seem strange to us now, we still don’t use it much beyond topping a salad or serving it along side jams, honeys, and charcuterie at a dinner party. Goats milk makes incredibly versatile cheese, which can and should be used in everyday cooking. Fortunately, the Omaha Farmers Market has a few vendors making and selling quality goat cheese. 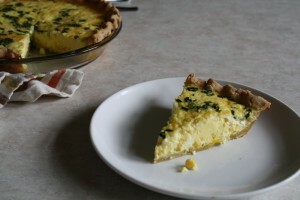 Find a plain chèvre, grab some sweet corn and make this Sweet Corn and Chèvre Quiche the next time you need a simple homemade meal. Pair ti with a salad or some soup to round out dinner. 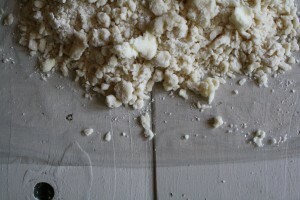 In a food processor, combine flour and salt. Pulse a couple times. Add the butter and pulse until its in pea sized pieces. Add the water in a steady stream, stopping twice to scrape the mixture down from the side of the processor. Lay a sheet of plastic wrap on a flat surface. Turn the dough mixture out onto the plastic wrap. The dough should be very loose and sandy. Gently form the dough into a ball; wrap tightly, then press into a disc. Chill in the refrigerator for at least 3 hours. (To make things easier. I usually make 4-6 crusts in an afternoon, wrap the individual discs and freeze them in a Ziploc bag. When I need crust for quiche (or pie), I transfer it from the freezer to the fridge in the morning, and by afternoon, I’m ready to bake. Lightly flour your countertop and roll out the dough into a 9-inch disc, dusting as needed so it doesn’t stick. Gently place your dough into a 9-inch pie plate and form it to the edges of the plate. Make the edges fancy or don’t. 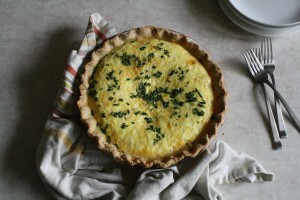 Quiche tastes good with our without fancy edges. Prick the bottom of the crust with a fork. Crumple up a piece of parchment then smooth it out again. Lay it on top of the crust and pour some dried beans or pie weights onto the parchment. Bake the crust for about 15 minutes. Remove from the oven, lift the parchment up to remove the weights or beans, and then bake for 10 more minutes. Remove crust from oven, increase temperature to 375 degrees F.
In a medium bowl, mix together eggs, milk, half and half, pepper and salt. 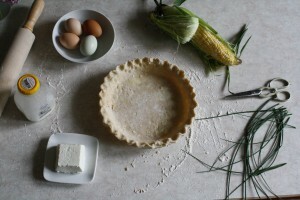 Sprinkle onions, crumble the cheese and snip the chives onto the pie crust. Pour in the egg mixture. Bake for 40 minutes. The center will be set, but still have a bit of a wiggle. The top should be golden. Let cool for about 10 minutes before serving.